*Context: This article was written in September 2012 under the illusions of an Ofsted framework where one-off lesson judgements were viewed as the norm, and the ‘myth’ of progress within a lesson was misinterpreted by the profession. As we all know, the landscape has since changed for the benefit of all teachers and it is vital that leaderships teams are all up to speed with observation validation and reliability. As a result, I have edited this article to match national dialogue (circa. June 2014) so that this discussion is not misleading to those that read it. The context for me posting this (original) information, stemmed from experiences of observing lessons from 2000-2014. We all love to talk in the classroom! You know your students better than me and you know what works for you, your subject, your school and your students. But, what I have discovered through my observational-experience in several schools, conducting over 1,000+ observations over 15 years, is that the deep-rooted culture of Ofsted, one-off judgements and lack of sophisticated feedback; or training of the observer, can lead to excessive teacher-talk for all the wrong reasons. For example, saying all the right things during an observation in order to impress the observer/appraiser/inspector so that they can tick a box on a school proforma. This is very damaging, because the teacher would steer away from what is typical, talking more, saying all the right things; therefore reducing the opportunities for students to continue with the learning process. Focusing in on a ‘specific component’ during an observation is acceptable if pre-agreed as part of a focus to a teacher’s CPD programme. This would assume that the observer and teacher have met beforehand to agree and observe specific components within a lesson. For example, this may be ‘teacher-talk’. This process is acceptable – to a degree – if part of a development process for the teacher; but should never be used as part of a school focus/priority, or for Ofsted-fulfilment. e.g. 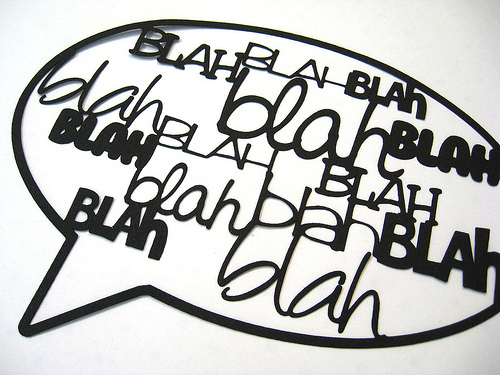 to reduce teacher-talk in class if it is just a fad. I do think this is where the problem lies: Proformas! Firstly, do not tick boxes. This resorts to a one-off framework of validating teaching. It is unreliable. As I have blogged before, talk to students; look in student books. Speak with students out of the class; look at teacher monitoring of progress (teacher-data) to validate the teaching and not the teacher. By observing the teaching and not the teacher, this will ensure that the observer is focused on teaching and key sources of data, rather than the teacher and teacher-talk. The danger being, that the observer will focus more and more on the teacher and their instruction; or that the teacher will talk more and more, knowing that an observer may be ticking boxes; thus leading to a performance! Observers should make notes, but do not make it all that you do. And for goodness sake, do not use a clipboard! Doing so, will subliminally encourage the observer to sit and start ticking boxes and most likely, focus more on the teacher and teacher-talk! I have collated ideas and strategies from others below. Read my article in Optimus Education (March 2013). 2. @kerrypulleyn: Tell students they must give developed answers by using connectives in their answer – for example they should include ‘because’ and ‘for example’, or allow time to prepare an answer with a minimum word count. 3. @pscSaysRelax: Provide pupils with a piece of information and ask them to come up with the questions in teams. Afterwards, each group takes it in turns to ask a question to the class. 4. @TeacherToolkit: Allow students to read out and define lesson objectives and keywords. 5. @LondonEducator: Start the lesson with a video clip and a question to spark an initial debate. No teacher input required. 6. @PscSaysRelax: Break up a particular piece of text onto separate sheets and put each part in an envelope before sticking one section under each table or row. Pupils then have to then work together to put the information back into its original order. 7. @Simon_ warburton: Spend time on getting the students to understand the routines in the room, settling down, pairing up, moving chairs and lesson starters so no input needed. 8. @Simon_warburton: Spend time working on the routines in class such as moving into groups, lesson starters, books out reviewing last lesson. 9. @LondonEducator: Get your pupils to lead part of the lesson. This could involve getting one of them to explain concepts to the rest of the class or leading a group discussion. 10. @lancslassrach: Start the lesson with an unusual or controversial image and ask students what they think is happening in the picture in order to prompt discussion. 11. @lancslassrach: Organise students do they sit in groups – they begin to rely on each other for support rather than constantly asking the teacher. 12. @kohlmand :Have clear routines and expectations; when they enter the room learning starts-they look for the first task or stimuli- is it on their desks?instructions on the board? Instructions in words or pictures? 13. @kohlmand: For novelty value give instructions through pre-made animations like go animate-my favourite the talking picz! 14. @futurebehaviour: I see myself as a “learning facilitator” not “teacher”. Then I know it’s ok to shut up for a bit! 16. @kerrypulleyn: Tell students they must give developed answers by using connectives in their answer – for example they should include ‘because’ and ‘for example’, or allow time to prepare an answer with a minimum word count. 17. @zoe_helen: Give the students a stop watch and let them monitor “your talking”. You are allowed a maximum of 10 minutes in the entire lesson. 18. @zoe_helen: Imagine you cannot talk! Then think how you will communicate your ideas and assess student progress without the use of teacher verbal input. 19. @cparkie: Have a period of reflection in each lesson. About 1 minute to consider what has been achieved. It must be silent. 20. @miss_c65: Co-operative learning: briefly explain the academic and social goal that the pupils will work towards achieving (5mins max) and then allow them to undertake the learning activities in pairs/groups. 21. @Ange_K1: For lessons where there has to be new information, do a Marketplace or put the information around the room in bits for the pupils to sequence. Or, if you’re lucky enough to teach science, do a practical and get the class drawing graphs (at KS3 that always gets them to a high level) and reduces the amount of talking I have to do. 22. Goodnessknows; Use talking partners regularly so EVERYONE is part of th classroom talk and gets ideas from others to develop their understanding and thinking. 23. @julierhunter: Provide a hook at the end if the previous lesson. Then ask the class to introduce what they need to know at the start of the next lesson. Student led start to the lesson. 24. @richielord71: Use flipped learning – students experience the didactic content as a homework activity prior to arriving to your lesson. Use talk partners in the classroom; they talk to each other from the very moment the lesson starts, stopping me talking! Put a timer on your smartboard – 2 mins tops!! Ask chn to feed on from each other- child A speaks, child B responds, child C reflects, etc. In MFL teachers need to talk a good deal or play recordings for students to get the input they need to acquire language. partner talk is OK, but inferior in quality to teacher talk. Every lesson? What happens during an observation? Surely an outstanding lesson must feature students working harder than the teacher? Who says listening is not hard work? In reality, teachers produce lessons to fit the current inspection fashion, of course. But I repeat: if you don’t get kids listening alot in MFL, you are short-changing them. It’s basic second language learning theory. One size does not fit all in the classroom. I find obs difficult as a part-timer,the routines are often not mine,also i was given satisfactory with main reason being i didn’ talk enough….sick of adhering to fashions! I don’t entirely agree with this. Students need to hear the language presented when they first start to learn it but this never has to come from the teacher if you don’t want it to. As they move onto new language, they can discover it for themselves from video, audio recordings, native speakers and also in written texts etc etc . Not sure why good quality input should not come from teacher. BTW some research shows that very young children, when acquiring their first language, pick up new sounds more quickly when they come from human rather than electronic sources. Anecdotally, as a teacher I felt pupils listened better when I was talking when compared to a recording. Rather than pupils writing down a learning objective while you tell them what it means and what they will be doing, ask the pupils to describe what they think the lesson will involve, what the outcomes will be and what support they will need. show them an example question and as what they think LO might be…. Please direct me to ‘the talking picz!’ you mentioned above. Can’t seem to see it on the web anywhere. Must say it’s worth also considering that an enthusiastic and engaging teacher who has developed an excellent learning environment can show incredible student learning progress even with, what some would consider too much, teacher talk. I was observed by an Ofsted inspector (not an official observation) and in my feedback he was talking about how engaged the students were and progress made etc etc, but I asked “surely there was too much teacher talk?” He said that was an interesting observation but the way the lesson was broken up, and the way that questioning and how the teacher talk was presented meant that students made excellent progress. The 30+ minutes that was observed had a lot of teacher talk, including questioning and class discussion. There was only a short post-it note exercise and two short student discussion exercises that weren’t teacher centred. That’s what made me question the judgement! Whilst it is good practice to encourage independent learning and to have productive and effective student-centered activities, it is worth noting the value of enthusiastic and engaging class discussion, questioning and (to some degree) teacher talk. I always video myself being a ridiculous character from History who has three key questions they have to find out the answers too! I make the video no more than 90 seconds! Hey presto, engaged students and not much teacher talk! Glad my ideas are being received in Poland. Thanks for the link.